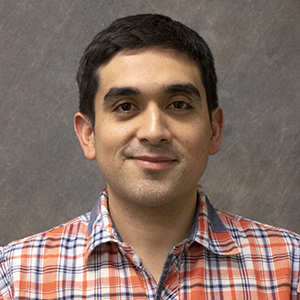 Guillermo Basulto-Elias is a postdoctoral research associate at the Institute for Transportation at Iowa State University. He has experience on statistical computing, data visualization, generalized linear mixed effects models, nonparametric statistics, machine learning, and stochastic processes. In recent years, he has worked on nonparametric models of data with measurement error and forensic statistics, which include footwear analysis, models for speaker recognition, and design and supervision of shoe prints forensic database. More recently, he has worked on software development for generating reports of crashes, and statistical models for traffic data, including linear mixed effects models, hierarchical Bayesian models, and functional data analysis. Poster at 10th International Conference on Forensic Inference and Statistics, Minneapolis, MN, on Shoe matching based on image cross-sectioning. Joint work with Martin Silerio. 2017. Poster at Joint Statistical Meetings, Seattle, WA, on Poverty Determinants in the US. Joint work with Natalia da Silva. 2015. Invited talk at XIII Probability and Statistics Workshop at CIMAT, Guanajuato, Mexico. Statistical Learning of Machine Learning? 2015. Invited talk at XIII Probability and Statistics Workshop at CIMAT, Guanajuato, Mexico. Complex Data Visualization in R. 2015. Invited talk at the 2nd. Conference of the International Society for Non-parametric Statistics, Cadiz, Spain. A nonparametric estimator and bootstrap confidence bands for the Kolmogorov canonical measure. Joint work with Víctor Pérez-Abreu and Miguel Nakamura. 2014. Poster at the International Society for Bayesian Statistics Meeting, Cancun, Mexico. Measurement error and compliance with physical activity guidelines in the US. Joint work with Brenna Curley and Alicia Carriquiry. 2014. Invited talk at Prudsys User Days Conference, Berlin, Germany. DMC 2014 Solution. Joint work with the winning team of the 2014 Data Mining Cup: Fan Cao, Xiaoyue Cheng, Marius Dragomiroiu, Jessica Hicks, Cory Lanker, Ian Mouzon, Lanfeng Pan and Xin Yin. 2014. Goswamy, A., Hallmark, S., Basulto-Elias, G., and Pawlovich, M. (2019) Safety Evaluation of Stop-Sign Mounted Beacons—A Cross-Sectional Study. Journal of Transportation Technologies, Vol. 09, No. 01. Basulto-Elias, G., Carriquiry, A., De Brabanter, K. and Nordman, D. (2017) “fourierin”: An R package to compute Fourier integrals. The R Journal, Vol. 9, No. 2.